What happens when a video camera's frame rate is perfectly in time with the beating of a bird's wings? It looks like the bird is levitating in mid-air without beating its wings. 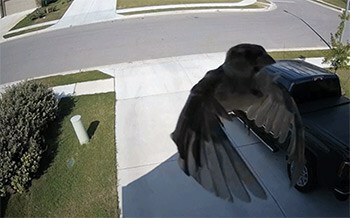 Al Brooks from Austin Texas experienced this exact phenomenon recently when his security camera captured a bird up-close. We've seen this phenomenon before with helicopters in the video below.